Welcome to the Home Office in the media blog. 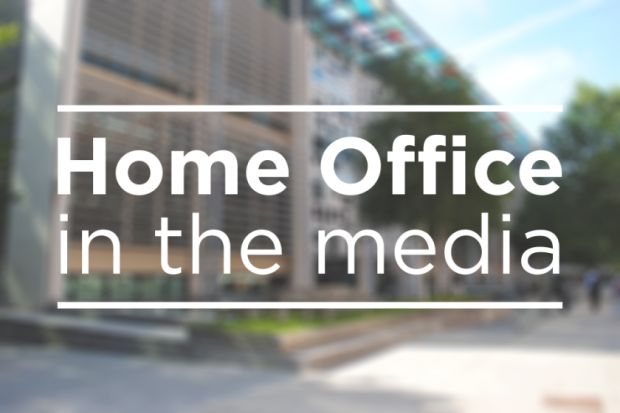 Our daily "leading stories" post will provide a summary of the main Home Office issues in the news and set out the department's full position. Today's Home Office-related news includes coverage of the Supreme Court ruling on income rules for those wishing to bring a foreign spouse to the UK and the launch of a consultation on retirement pay-outs for senior fire and rescue officers. Following extensive broadcast coverage this morning, the Supreme Court has handed down judgments in relation to an appeal brought by claimants challenging the Government's minimum income threshold for British citizens sponsoring a non-EEA partner and non-EEA children. The Supreme Court has confirmed the lawfulness of setting a minimum income threshold at the current levels (£18,600 for a partner, £22,400 for a partner and one child, and an additional £2,400 for each further child). The Times and Sun report that senior fire officers will be banned from claiming big retirement pay-outs then “boomeranging” back into the same or very similar jobs shortly afterwards. It's completely unacceptable for fire services to act in this way. It erodes public confidence, undermines the respect of firefighters and staff in their leadership, and creates the perception that there is one rule for file and rank firefighters and another for those at the top. This Government is reforming the fire service to make it more accountable, efficient and effective in performing its vital duties on behalf of the public. So I'm going to rewrite fire service rules to stop authorities employing boomerang bosses — and conduct a wider review of the guidelines to help drive the Government's reform programme.